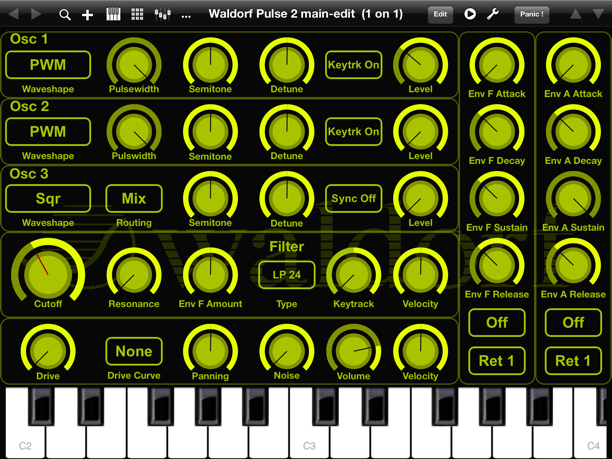 The Waldorf Pulse is a new version of the well known original Waldorf Pulse monophonic rack synthesizer. 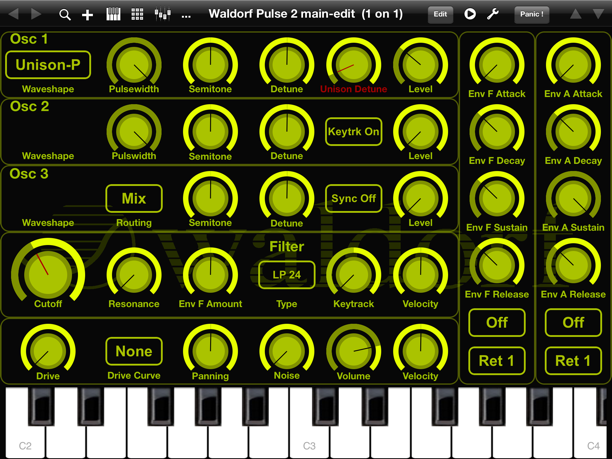 The new versions is in the shape of a desktop synth and very much like the Waldorf Blofeld. A LCD gives way more information as the original Pulse display. But the display is not featuring the nice graphics as seen on the Blofeld. The sound is very much the same as the original Pulse. Soundwise there are two new paraphonic modes to play chords. But of cause all the voices have to pass through the one filter. So this is just an add-on feature and does not give you a real polyphonic Pulse. The version 1.02 of a TB MIDI Stuff template to edit the most basic Pulse 2 parameters from this iPad app via MIDI is here for free download. 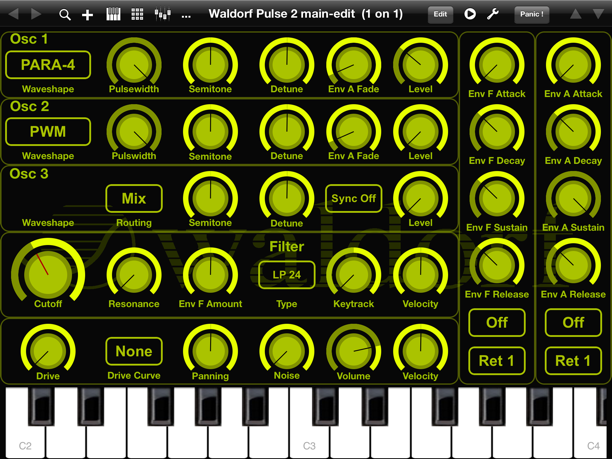 Import the unzipped file Waldorf Pulse 2 main-edit.tbms into the application folder of TB MIDI Stuff in iTunes. Be sure to select the Pulse 2 as MIDI connection in the app settings. Special unison and paraphonic parameters visible when oscillator is set to these modes. See screenshots below. The 4 unison modes with the special unison detune parameter on oscillator 1. The 2 paraphonic modes (here PARA-4 for two osc and four voices) with the special amplitude envelope fade parameter parameter on oscillator 1 and 2 (PARA-4 mode only).